VR-Studio(R) is an advanced VR system made with the latest architecture. New features include support of large scale project handling a lot of terrain data, new CAD style user-interface utilizing diagrams and objects, multi-user editing, improved performance based on multi threading and modified section functions. VR-Studio can process in parallel by adapting multi core CPU and multi CPU. At the time of dividing triangles and generating LOD data, VR-Studio does parallel processing. 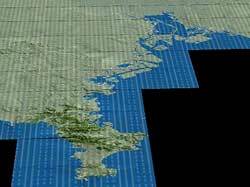 at the time of triangle division of terrain data and generation of LOD data. Since VR-Studio has adapted LOD (Level of Detail) technology, it can display terrains of wide area speedily. Surface of the terrain is basically expressed by the triangle. If you draw detailed terrain in VR space at the point distant from the view, triangle of a few pixels or triangle of smaller than one pixel might be drawn. Since the triangle has being drawn at the same place, the process will be useless. With LOD, VR-Studio draws a visible triangle on screen in a certain size, and estimates the size of the triangle to reduce the amount of processing and draws a triangle combined from multiple triangles based on the size of triangles. This technology enables better display performance even when handling a large scale terrain because the number of triangles does not increase. In addition, for a reduction in the processing time and updating the screen each time. Data is saved of the combined triangle in advance, and selects and displays the appropriate combined data while processing drawing. In VR-Studio, you can check the 3D view and edit at the same time. You can do this work by opening 2 screens at the same time. For example, you can check and edit one element from multi point of view. Using multi monitors makes the interface easier to operate. FORUM8 have developed it in a concept of adjusting VR-Studio interface to users' work environment by offering flexible user interface. VR-Studio has strong undo/redo functions. This allows you to go back to the previous status or operate again by using undo/redo buttons for all editing operations. Since history of the edit is stored, VR-Studio does not have "confirm" and "cancel" button on each edit screen. At the time of the creation process, input data may become temporarily invalid, VR-Studio does not require valid data input. When invalid data is input, the system does not go to the next process, however, data is saved and you can continue the inputting of data. In addition, you can see the location of the parameters where invalid data is input in order to make data correction easy with the data verification tool. VR-Studio has a layer function and can display each element of the data by layer. VR-Studio allows you to create VR space that consists mainly of outer building space and makes terrain and roads easily. 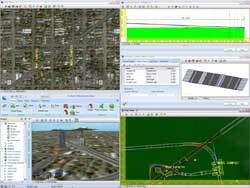 In addition, it allows creating lakes, flight routes, background, rivers and pipes and the setting of 3D models and trees. By setting the horizontal alignment, longitudinal slope, cross slope by an element of cross section the 3D model of a road is generated automatically. You can easily set, move, add and delete transition points with mouse clicking, you can also enter the exact figures for the actual road design representation. After you have created road alignment, you can define the cross slope by cross section. Creation of the road alignment is finished by making the necessary cross section first and applying it to road alignment. Elements placed on the road, such as a cross-section, bridges and tunnels are set according to the distance from the starting point. You can add a station point and set the elements based on the distance from the station point. Station point should be set based on the distance from the other elements (including the start point). If you change the position of the station point, the element belonging to the station point is updated. With this feature, after setting station points in along the road, you can easily correct the positioning of the elements after editing and road alignments. One cross section comprises of combinations of multiple parts. The parts define the width of the parts of a road. For example, vehicle road, pedestrian road curve and division can be made as a part. While you can change the gradient for the width of the road by using a cross-section, you can change the gradient for the width of part of the road at any point. It is possible to update only the width in that position. If you set a modifier element, you can set the following. Insert, delete and replace of the cross section parts. Transition of cross section slopes can be modified with cross section. You can update the width of the fixed point by setting modifier element. 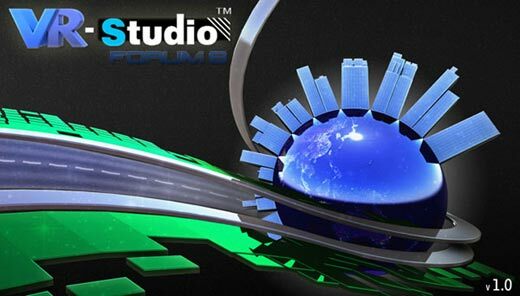 VR-Studio has function to create whole traffic network. It allows you to make road structure below easily and efficiently. 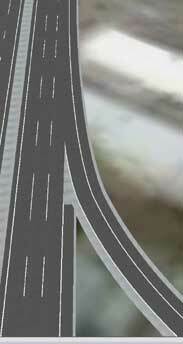 Ramp road : Set the point of ramp connection on main road and allows drag-and drop road connection. intersection : When you execute intersection generation after setting road, basic shape of the intersection is set automatically. VR-Studio offers functions for modifying the shape of intersection by editing screen and creating marking. Bridges and tunnels are automatically generated by defining cross section of road bridge beam or tunnel wall and setting bridge and traffic space on road alignment. To lengthen the traffic network, you can connect independent to the end of the road. VR-Studio allows the editing of one project by multi users with multi-user editing function. Users can share the data with the source management server, and manage store and synchronize. When you work, get the latest status of the data from the management server, and you can update the data on the server after editing by the local machine. When multiple users work simultaneously, the element is locked to edit and one element can be edited by only one user. After editing is over and server data is updated, the lock will be released and other users can edit the data. Work by this procedure allows simultaneous editing of the independent elements by multiple users. It leads to improved efficiency in working with large-scale data. In addition, complete editing history is recorded by using the management server, it allows you to return to incorrect data on the previous status and edit. VR-Studio has sample data. The shape of the terrain data is not rectangular. The length of the highway-like road is 70 km. If you move to the favorite point "Mt. Fuji", you can see the sight from the top of the Mt. Fuji. Move to camera position "Projectview", you can see the interchange. If you look at ramps at the interchange, you will find that the road is divided or connected with the large angle and you can see the smooth connection of roads at the junctions and sections. 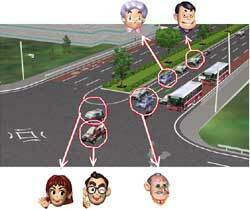 Move to camera position "Townup", here is a 3-junction intersection to the sliproad to the highway. VR-Studio allows the changing of road structures including intersections. When you drive the road, you can drive a car in any direction or alongside the road as well as in any of the existing lanes within the sample data. 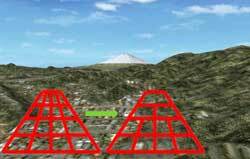 We are developing a traffic simulation function of the road network. 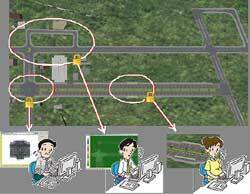 We are planning to implement a signal control, complicated drivers behavior and detailed settings of the amount of traffic and the driving pattern. Link to/from various design software and analysis programs planned. 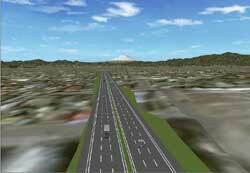 We are planning to enhance the standard format of 3D models and standard file formats of road design. Adapting a special curve form of the railway alignment and the function of railway crossing as well as an intersection.